A deadly weapon and symbol of power – jewellery for a man, with magical properties. The sword gave power to the warrior, but the warrior’s strength could also be transferred to the sword. That is how they were bound together: man and weapon, warrior and sword. This sword was found in Langeid in Bygland in Setesdal in 2011. It is a truly unique sword from the late Viking Age, embellished with gold, inscriptions and other ornamentation. The discovery of the sword has not been published until now, when it is being displayed for the first time in the exhibition TAKE IT PERSONALLY at the Historical Museum in Oslo. The sword must have belonged to a wealthy man in the late Viking Age. But who was he and what magic inscriptions are set into the decoration – in gold? Was the owner of the sword in the Danish King Canute’s army when it attacked England in 1014-15? In the summer of 2011, archaeologists from the Museum of Cultural History in Oslo discovered a Viking burial ground in Langeid in Setesdal in southern Norway. In one of the graves they made a startling discovery. “Even before we began the excavation of this grave, I realised it was something quite special. The grave was so big and looked different from the other 20 graves in the burial ground. In each of the four corners of the grave there were post holes,” said excavation leader Camilla Cecilie Wenn of the Museum of Cultural History. The post holes reveal that there was a roof over the grave, which is a sign that the grave had a prominent place in the burial ground. But when they dug down in the coffin in the bottom of the grave, there were few traces of gifts for the afterlife, only two small fragments of silver coins. The coins were from northern Europe; one was probably from the German Viking Age, judging by how it was embossed, while the other was a penny minted under Ethelred II in England dating from the period 978-1016. The sword must have belonged to a wealthy man who lived in the late Viking Age. The sword is 94 cm long; although the iron blade has rusted, the handle is well preserved. It is wrapped with silver thread and the hilt and pommel at the top are covered in silver with details in gold, edged with a copper alloy thread,” said project leader Zanette Glørstad. “When we examined the sword more closely, we also found remnants of wood and leather on the blade. 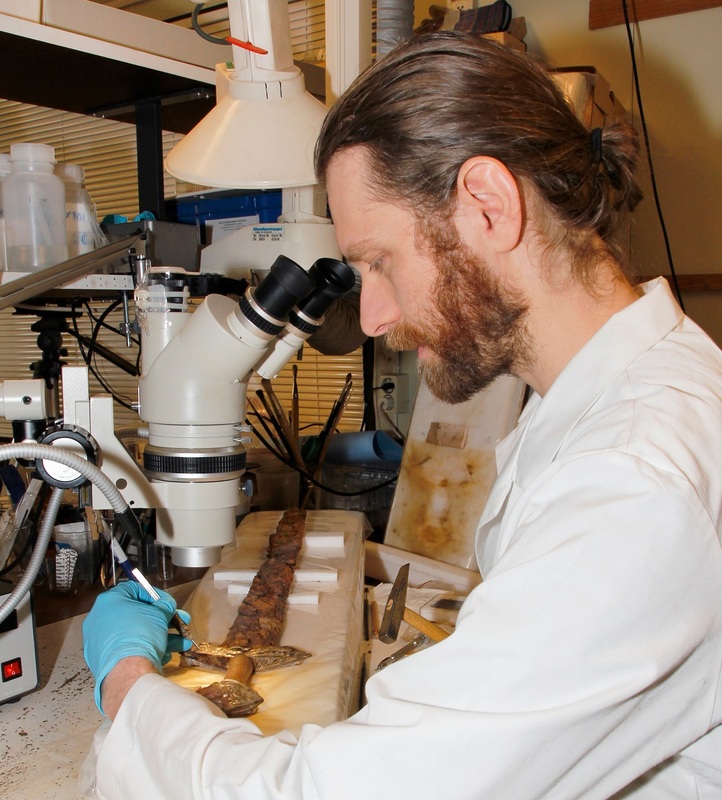 They must be remains from a sheath to put the sword in,” explained curator Vegard Vike. He has had the challenging task of cleaning up the handle and preserving the sword. The sword is decorated with large spirals, various combinations of letters and cross-like ornaments. The letters are probably Latin, but what the letter combinations meant is still a mystery. “At the top of the pommel, we can also clearly see a picture of a hand holding a cross. That’s unique and we don’t know of any similar findings on other swords from the Viking Age. Both the hand and the letters indicate that the sword was deliberately decorated with Christian symbolism. But how did such a sword end up in a pagan burial ground in Norway? The design of the sword, the symbols and the precious metal used all make it perfectly clear that this was a magnificent treasure, probably produced abroad and brought back to Norway by a very prominent man,” added Camilla Cecilie Weenn. “The way swords are referred to in the sagas suggests that the sword is an important bearer of the identity of the warrior. A sword reveals the warrior’s social status, his position of power and his strength. The sagas also tell us that gold had a special symbolic value in Norse society. In Norse literature gold represented power and potency. Gold is rarely found in archaeological material from Viking Period and then too, it stood for power and potency. This indicates that gold had considerable economic and symbolic value. Based on the descriptions in the literature, we can say that the sword was the male jewellery par excellence of the Viking Age,” said Hanne Lovise Aannestad, the author of a recent article on ornate swords from the days of the Vikings. The sagas emphasise the importance of the ornate sword. Swords could have hilts of gold with ornamentation and magical runes. The mythical sagas tell of magical swords forged by dwarfs. The creation of myths around the art of the blacksmith and the making of high-quality swords may be related to the fact that few people mastered the art. The production of metal objects of high quality may have been a form of hidden knowledge unavailable to most people. This gave the objects a magical aura. “In Mediaeval literature, swords are referred to as aesthetic, powerful and magical objects. The many similarities between the descriptions of swords in Norse and Mediaeval literature suggest that the splendour of the sword in the latter had roots in the Viking notions of the symbolic power, magic and ritual aspects of the ornate sword. The Viking Age was a period of great social upheaval. At times like that, certain symbolic objects may play an important role in negotiating social positions. There is much to suggest that these magnificent swords were such objects, reflecting the status and power of the warrior and his clan,” said Hanne Lovise. The axe found in the same grave has no gold decoration. But the shaft is coated with brass and it may well have flashed like gold when the sun shone. Such shaft coatings are very rare in Norway. But a number of similar battle-axes have been found in the River Thames in London. That makes the axe particularly interesting. Dating of the axe from Langeid shows that it belongs to the same period as the axes found in the Thames. There was a long series of battles along the Thames in the late 10th and early 11th centuries. The Danish king Sweyn Forkbeard and his son Canute led their armies against the English king in the battle for the English throne. Even the Norwegian king Olav (Haraldsson) the Holy was involved in the attack on London in 1009. The men under the Danish King were from all over Scandinavia. Did the axes get lost in the Thames during the numerous skirmishes, or did the victors throw them in the river? Did the sword belong to a Viking from King Canute’s army? Further down the Setesdal Valley we find a runic stone, which says: “Arnstein raised this stone in memory of Bjor his son. He found death when Canute “went after” England. God is one.” (Translated from the Old Norse). The text probably refers to King Canute’s attacks on England in 1013-14. It is likely that the stone was erected just after the incursions, by a father whose son never came back home. A written source from the 12th century states that King Canute’s closest army had to meet certain requirements. Soldiers had to honour the king, had to belong to the leading families in society and also had to provide their own gilded axes and sword hilts. The Langeid sword would no doubt have been approved by King Canute, probably also the axe. The sword was made outside Norway and an Anglo-Saxon origin is quite possible. The axe is very similar to those found in the Thames, especially in its brass coating. The grave with the sword also contained the only coin found in Langeid from the Anglo-Saxon region, which increases the possibility that the dead man had a particular connection to the events in England. “It’s quite possible that the dead man was one of King Canute’s hand-picked men for the battles with King Ethelred of England. Seen in connection with the runic stone further down the valley, it is tempting to suggest that it is Bjor himself who was brought home and buried here. Another possibility is that his father Arnstein only got his son’s magnificent weapons back and that, precisely for that reason, he decided to erect a runic stone for his son as a substitute for a grave. When Arnstein himself died, his son’s glorious weapons were laid in his grave. The death of his son must have been very tough on an old man. Perhaps their relatives honoured both Arnstein and Bjor by letting Arnstein be buried with the weapons with such a heroic history,” said Zanette Glørstad. The runic stone dates from the same period as the final phase of the burial ground and testifies that Christianity is about to take root in Norwegian society. It is the oldest runic stone in Norway that refers to Christianity. Could this also explain why the weapons were placed outside the coffin? In a transitional period, people may have chosen to use both pagan and Christian elements in a funeral. The Langeid grave is from one of the last pagan funerals we know of from Norway and marks both the greatness and the end of the Viking Age. Ever since the summer of 2011, the sword found in Langeid has been unpublished. Its display today has been made possible by the meticulous work and research of conservators and archaeologists at the Museum of Cultural History. Finally, it can be seen by the public and is displayed in the exhibition called “Take it personally” – an exhibition of personal jewellery and adornment over time and space in the Historical Museum in Oslo.